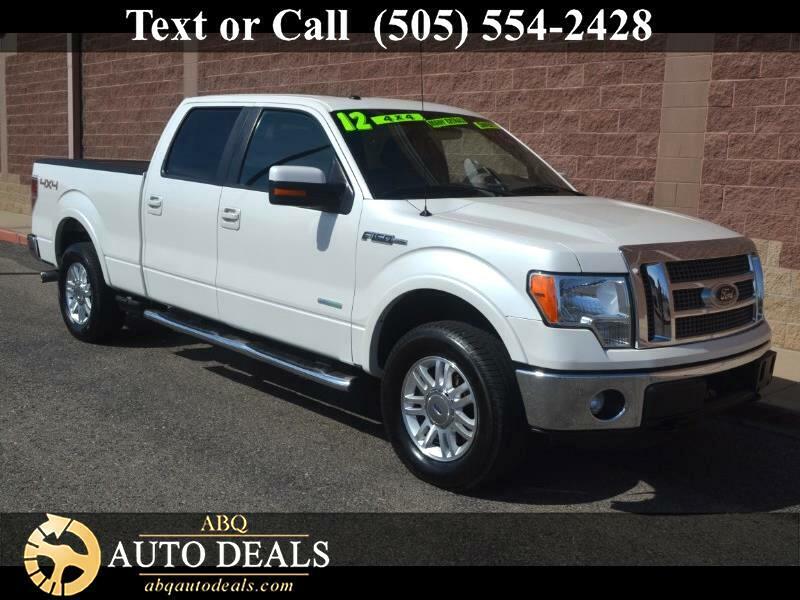 Check out our Accident Free 2012 Ford F-150 Lariat SuperCrew 4X4 displayed in an incredible White Platinum finish! Powered by a TurboCharged 3.5 Liter EcoBoost V6 that supplies 365hp while connected to a tough 6 Speed Automatic transmission with Ford's Tow/Haul mode. Expect near 22mpg with this Four Wheel Drive combination. The exterior is enhanced by great looking wheels, chrome tubular side steps, chrome bumpers/grille, a sliding rear window, tonneau cover, tailgate step, a large sunroof, box side steps, bedliner, and a trailer hitch receiver. Besides the luxury look and performance everything - Inside this Lariat is top notch all the way with wood grain trim, a leather-wrapped steering wheel with mounted controls, power-adjustable heated and ventilated front leather seats with driver memory, dual-zone climate control, and Ford SYNC that features Bluetooth and a stellar AM/FM/CD audio system with available SiriusXM radio to keep you connected and entertained. Just because this is a big and beefy machine doesn't mean that Ford is light on safety. This F-150 benefits from all the great features that have helped Ford lead the charge with onboard safety like a rear view camera, multiple airbags including thorax, advance trac with roll stability control, reverse sensing and even shift on the fly to make this tops in its class. So stop dreaming and start driving. Print this page and call us Now... We Know You Will Enjoy Your Test Drive Towards Ownership! Your buying experience with ABQ Auto Deals is our number one priority.